Guild Associates has a rich history in product and project development. This page lists projects and products that are not listed in our breadth of current offerings. While these are not currently manufactured, the technology and innovation may be applicable to other projects. If you are interested in learning more about these projects, have some ideas about commercialization, or have thoughts on how it can be applicable to your project, please contact us! The decontamination mat, shown at the left, offers a clean area during thorough decontamination. The decontamination mat is designed to rapidly absorb liquid chemical agents splattered onto it. Each decontamination mat consists of an absorptive fiber material laminated onto a low-density polyethylene (LDPE) backing. The sorbent powder (200-SiC-1005S) is placed between the LDPE and absorptive fiber material, which enhances the agent absorptive capability of the decontamination mat. Each decontamination mat is shipped and sealed inside an airtight pouch. The use of the decontamination mat entails opening the pouch and removing the mat from its package, unfolding the mat and placing in an area where a clean surface is desired. The decontamination mat is a single use, expendable item, intended for both combat and training purposes. The Protective Blanket was developed under the auspices of the Soldier and Biological Chemical Command (SBCCOM) at Aberdeen Proving Grounds in Edgewood, Maryland. The Protective Blanket may be used to contain contamination while transporting contaminated casualties. The Protective Blanket is designed to rapidly absorb liquid chemical agents splattered onto it. The Protective Blanket prevents the spread of agent contamination to personnel handling chemical warfare casualties and contains the vapor hazard emanating from the casualties. Each Protective Blanket consists of a carbon cloth fiber material laminated onto a low density polyethylene (LDPE) backing and exterior Velcro straps. The Protective Blanket is designed absorb liquid agents, thereby eliminating the contact hazard. The vapors are contained in the pore structure of the blanket’s fiber. The use of the Protective Blanket entails wrapping the blanket around a casualty and securing it with the Velcro straps. Each Protective Blanket comes inside an airtight pouch for storage. The Protective Blanket is a single use, expendable item, intended for both combat and training purposes. As a subcontractor to Avon Rubber & Plastics, Guild Associates performed all of the filter design work, which amounted to 20% of the total contract award. Guild Associates is responsible for the development and production of the primary and secondary filters to be used in the mask. This project involves development of a primary filter that removes the required NBC agents and as many TICs (Toxic Industrial Chemicals) as possible. The filter has a minimal thickness, and the shape conforms to the contour of the mask around the face. Guild Associates investigated three concepts for a thin, conformal-shaped filter. Working with the user community, Guild settled on a conformal granular filter with a twist-off connection. Utilizing a novel adsorbent packing technique, the filters satisfied the chemical agent challenge requirements of the JSGPM program. Guild Associates continues to improve filtration media performance and broaden the protection agents TICs. For further information about Guild Associates filtration media, click here. FLOCSS was designed from the ground up with a multi-agent mindset. Consequently, the Guild team is focused on advancing and preserving versatility and autonomy. These themes have translated into a robust system architecture that enables it to be scalable from a single agent to as many as 10, and can be operated as manually controlled UAVs to a fully autonomous multi-UAV system with onboard sensor-driven autonomous behavior. Autonomy is facilitated through a Linux-based, UAV-resident mission management system that features an open Unmanned Aircraft and robust framework for internally-developed algorithms as well as integration with collaborator's or 3rd party software. When operated in high autonomy mode the system has been demonstrated to significantly reduce the operator burden associated with multi-UAV operations management. Complementing these UAS capabilities is an intuitive Operator Interface (OI), which functions as the gateway to the system's health status updates, performance metrics and data presentation/visualization. The OI provides a simulation interface for system behavior/algorithm examination, while being architected to permit a nearly seamless transition from simulation to actual flight. The system is also designed so that it can be accessed through a secure IP connection, providing multiple networking and interoperability options with additional command and control systems. All this capability is offered at a fraction of the cost of many existing UASs. The Trinity PFC Abatement system is designed to treat tool exhaust from four chambers of a 200 mm etch tool or three chambers of a 300 mm etch tool. The system is designed to be located downstream of the dry pumps and will not interfere with the operation of the etch or CVD tool. Therefore, no process re-qualification is required. The abatement unit is designed so that it can be readily by-passed in the event of unscheduled maintenance. In this manner, the abatement unit can be serviced without interfering with the operation of the etch tool. The system also includes an emergency by-pass valve to automatically divert the tool exhaust in the event that water to the scrubbers is interrupted. The catalytic destruction process differs from the thermal incineration process in that a catalyst is used to destroy the PFC’s. The use of a catalyst offers several advantages over the thermal process. These advantages include lower operating temperature, smaller volume, reduced energy costs, more controlled process, no formation of partial or incomplete combustion products and no formation of thermal NOx. In addition, the lower operating temperature allows the catalytic process to be operated with electric power. Therefore, there will be no need to install lines to deliver combustion gases (e.g. methane) to the catalytic abatement process. Note: For information about the catalyst for this system, click here. 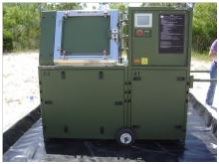 The Field Medical Oxygen Generation and Distribution System (FMOGDS) was developed under the auspices of the Medical Materiel Command at Fort Detrick, Maryland. The result of a multi-tiered competition, the system produces oxygen that may be distributed directly to field hospitals or used to fill a variety of standard oxygen cylinders, including D, E and H-type. Importantly, filling smaller cylinders, D and E, is entirely automated, greatly reducing manpower needs while simultaneously insuring potentially dangerous cylinder filling operations are completed safely and meet stringent cylinder filling criteria of the Compressed Gas Association (CGA). The chemically-hardened system entered limited production in 1994 and the first systems were subjected to comprehensive testing by troops from organic field units. The systems were submitted to a full battery of environmental, transportation and performance tests that were fully evaluated by DoD project staff. In addition to designing and building the systems, Guild Associates completed a comprehensive logistics program and prepared detailed training and engineering documentation material. 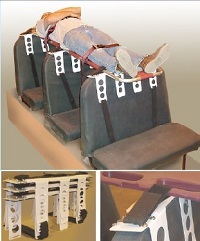 The Patient Transport System transforms a school bus into a vehicle capable of transporting eight non-ambulatory patients. The brackets are slipped over the school bus seatbacks. Two straps travel from the front part of the bracket, underneath the seatback, to the back side of the bracket, pulled tight and Velcro®’ed securely in place. 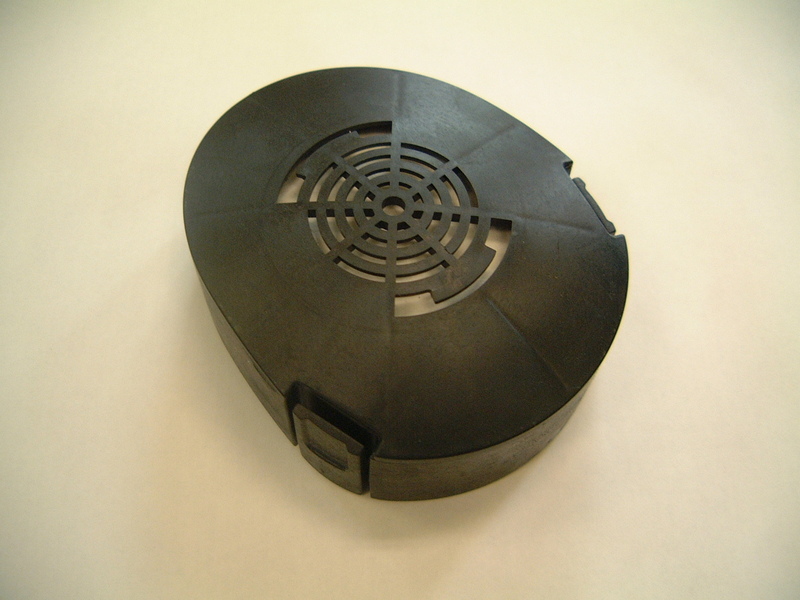 Velcro® is also used to secure the stretcher to the bracket. The PTS is ideal for transferring mass casualties to hospitals or collection points. The PTS also can be used for the evacuation of hospitals, nursing homes or the elderly due to natural disasters. The XM25 Decon Apparatus, Sensitive Equipment (DASE) was developed to provide thorough decontamination of sensitive equipment, such as laptop computers, night vision goggles, sights, etc., of chemical and biological agents without affecting the operational readiness, reliability or maintainability of the equipment. The XM25 Block I optimization utilizes a batch operation including a sonicated solvent wash to remove agent from the sensitive equipment. Spent wash solvent is recirculated through filters to remove chemical and biological agent from the solvent. The system removes chemical (GD, VX, HD) and biological agents (Bacillus anthracis, vaccinia, Yersinia pestis) from the sensitive equipment to below detectible levels.